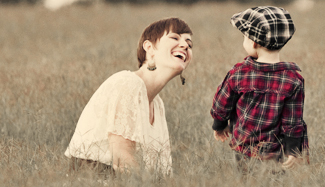 I've written before about my affinity for "Grow With Me" nursery themes. I mean, you put so much into a baby's special space... it's nice to see it work a little longer! 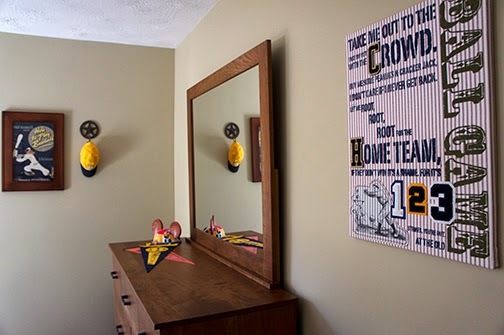 I chose vintage cowboy decor for my oldest son and vintage baseball for the younger. Well, it's been nearly nine years for the older, four years for the younger, and we're still rockin' most of their original nursery character. 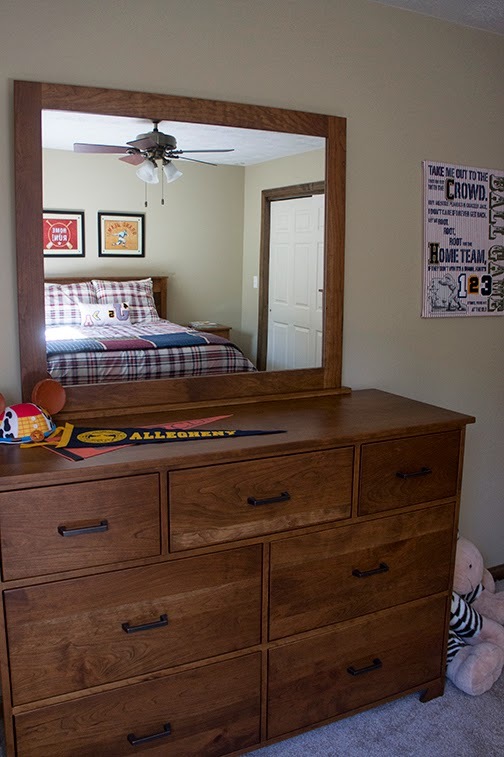 The picture below is my youngest's room in the new house - pretty typical of the rest of the house. 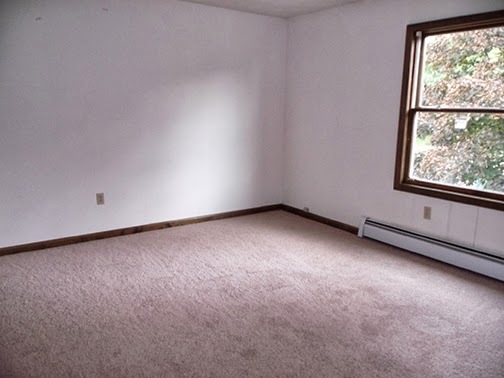 Terrible carpet, bad paint, no lighting. And, here's his room today! 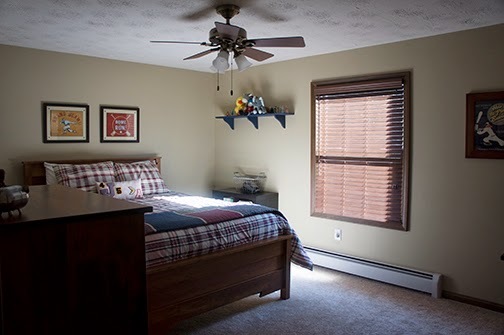 A few coats of paint, lighting, new carpet, 2" wooden blinds, and it's now a warm and cozy room for the little tyke. 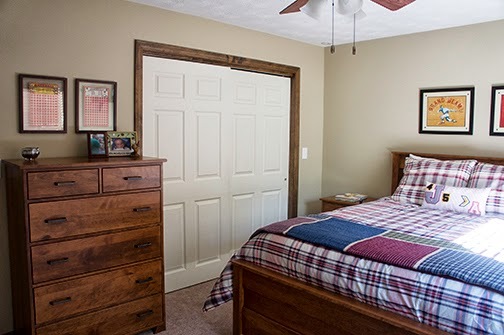 The bedding is a Tommy Hilfiger steal that I found on Overstock.com. 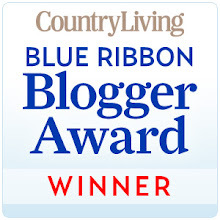 It's a comforter set paired with a denim bed skirt. Remember my subway art project? It greets visitors as you enter the room. 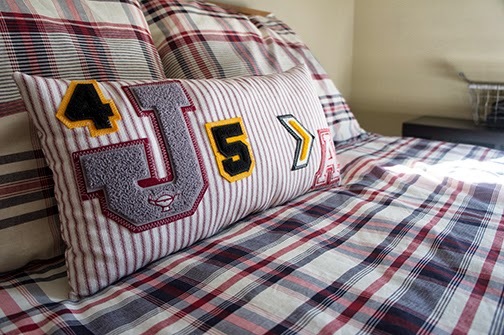 I made a simple bolster pillow with leftover nursery fabric and my sports letter appliques. 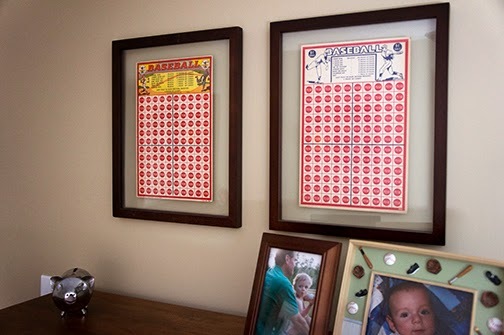 My penny-punch art project is hanging proudly on the wall. And the furniture... can we just chat about this furniture for a minute? We left the nursery furniture behind when we relocated to Pennsylvania and we were in the market for something with longevity. We were so excited to find an Amish furniture store in our local area. We ordered this set and anxiously awaited its arrival for months. It could not be more perfect - it's simplicity, amazing craftsmanship, beautiful wood... this is a set that will be with us for the rest of our lives. I seem to end each of these posts with the same closing - we have really come a long way toward making this house a home. I absolutely love it. We're embarking on our biggest DIY project yet - the master bathroom. Hope we don't get flushed away!